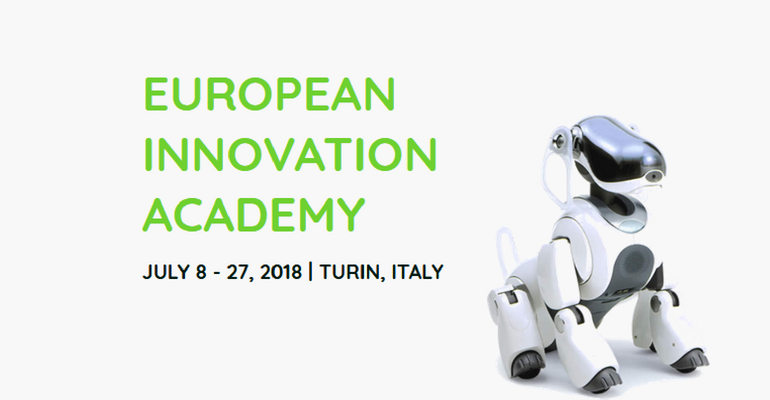 For the third year in a row, the Politecnico di Torino will host a unique workshop of ideas that will change the world: the European Innovation Academy (EIA). During three weeks (From July 8 to July 27), over 500 university students and aspiring entrepreneurs, coming from over 60 countries, will be in Turin to pitch and develop their idea for a company. A team of entrepreneurs, investors and mentors from all over the world will help their ideas become successful. And what’s more, from this year on there will be something new: the EIA team will be joined by AIBO – the first robot dog based on machine-learning technology, produced by Sony. Special guests from UC Berkeley (Rick Rasmussen), Transferwise (Lars Trunin), Google (Martin Omander) and other companies from the Silicon Valley will hold a one-day course for ambitious Italian SMEs, offering a complete overview of the innovation process in a company. Thanks to Turin’s Chamber of commerce, EIA’s partner from the start, 50 entrepreneurs and managers from Turin who are committed to the digital growth of their company will participate in the Masterclass for free. EIA Startup Expo Day is an exclusive event, planned and organised to show the innovative ideas of participants, obtain instant feedback from customers, carry out market research and exchange ideas with the experts of EIA, dedicated to technology and trends. World-changing ideas pitched to the technology expert public. The top 10 teams will receive prizes and the attention of investors.